Two medievalesque towns are residing on either side of a painted yellow line, one town for left-handers, the other for righties. The origin of the line is unknown, though it is carefully tended and monitored by the Order of the Ambidextrous Knights. 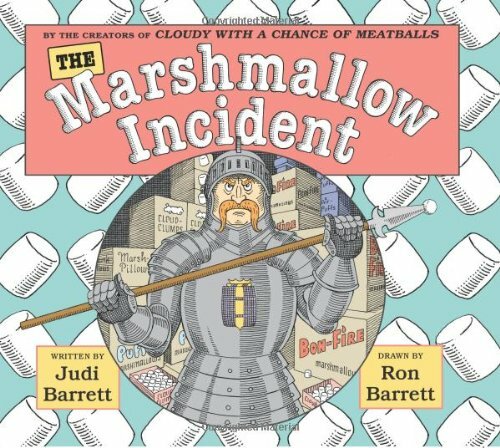 When a citizen accidently crosses over the line, the Knights deal with the crisis by firing stockpiles of marshmallows at everyone on both sides. Actually enjoying the fluffy barrage, both towns unite to celebrate, erase the line, and to live in harmony forever after. I love Cloudy With a Chance of Meatballs but I’m afraid I was underwhelmed by this Judi Barrett effort. The plot has some similarity to Dr. Seuss’ The Butter Battle Book (two groups at odds with each other over small differences). However, there wasn’t the one-upmanship conflict to drive the story that Butter Battle had. The illustrations by Ron Barrett are as good as always!